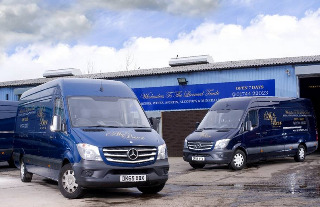 The St Helens-based company delivers alcoholic and soft drinks to pubs, clubs, restaurants and hotels across the North-West, and has taken delivery of a trio of long-bodied Mercedes-Benz Sprinters arrived via the Warrington branch of dealer Roanza Truck & Van. The firm said it previously relied on vehicles by a rival manufacturer, as they were the cheapest on offer. “That proved to be a false economy,” recalled managing director Chris Lawler. “They were terrible – something was always going wrong. Not only were we were paying a fortune to keep them on the road, but it was also a huge job to meet our delivery schedule, and live up to the dependable service promise we make to customers. The company’s new vans are 20th Anniversary Special Edition Sprinter 313 CDIs, introduced to mark the two decades that have passed since the van’s launch. They are funded by a hire purchase agreement with Mercedes-Benz Financial Services, and are being maintained under a Service Care plan that covers all labour costs and parts required for scheduled servicing. “The Service Care package means our routine maintenance costs are fixed so budgeting is much easier, while Roanza have also been extremely attentive, not only while we were ordering the vans, but also since we took delivery. We definitely made the right decision,” added Lawler.